“The Alfetta is full of new engineering thinking and will be a more modern car, one built to a high standard too. It will be a future classic, we believe.” So, reasons to be optimistic. For a very long time Alfa has indeed been guilty of making cars that have been a bit more fragile than was acceptable in today’s increasingly competitive market. The new Alfetta replaces the boxy 1750 and 2000 saloons with something altogether more modern, sleek and fashionably sharp edged. The design is an in-house job from Alfa’s Cento Stile and it looks jolly smart. Alfa has decided to reverse the trend towards nose heaviness too, by the relocation of some of the major components inside the new car’s chassis. In the case of a sports saloon like the Alfetta, this means placing the main masses at either end of the wheelbase, as close as possible to the wheel centres, thus helping to maintain a low polar moment of inertia and a low centre of gravity. Before setting off, the poor photographer and I were forced to endure a two hour seminar on the laws of physics and the elements of chassis engineering. The gist of this perishingly tedious lecture was as follows: In the production car, the clutch and gearbox are positioned at the back, all mounted in a light alloy casing together with inboard rear disc brakes. It is all fixed to the body structure to reduce unsprung weight. With the engine up front and passengers in the middle, a perfect weight distribution is attained. Alfa’s famed Grand Prix cars of the ‘fifties used the same de Dion system to win two GP championship. So, it’s a case here of winning in 1953 and selling in 1973. The reduced load on the front suspension means a lighter steering effort. The front suspension involves double wishbones, telescopic dampers and longitudinal torsion bars. These are tuned to try to reduce the famous Alfa body roll which made cornering in earlier cars an experience similar to swerving in a motor boat on a heavy sea. The only slight disadvantage with all this is that the gear linkage is now improbably long and changing a clutch disc now means the engine must be removed from the car entirely. The car weighs 1060 kilos. So, that’s the introduction and background to the car. A brand new Alfetta was provided for us at Alfa Romeo House in Neasden and we planned taking it on a bit of a spin to see how it matched Alfa’s promises of better quality and fancy engineering. The car attracted a lot of attention from shoppers and children as we tried to get the engine to fire. Presumably the rakish Italian styling and lurid paint must have looked very different from the humdrum Humbers and Triumphs and Fords driving past. We had a good lunch in the Neasden Arms, by the way. Their cottage pie is very like a shepherds pie and if you like shepherds pie, that’s good news. I had the shepherds pie and the photographer had a pint of bitter and five of my smokes. A dove grey interior is available. Sitting in the car waiting, one notices the softness of the dove-grey fabric of the seats and the Soviet-inspired plastics used throughout. The ultra-smooth wooden steering wheel looks sporty even if it can be a little slippery in warm conditions (that’s not Neasden though). The doorskins are nicely appointed with matching cloth. Accessories include a heater, an FM radio and a small storage box for lint, supernumary components and paperclips. 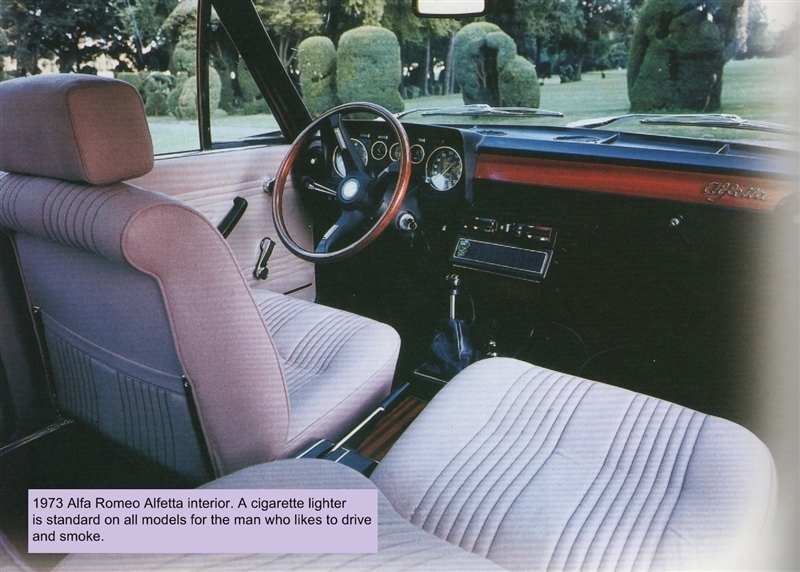 A cigarette lighter is positioned near the gear lever and the ashtray is quite satisfactory. All the switchgear and gauges worked correctly and most are within reach of either the driver or passenger. Inside the dash, carpets and cloth seats wouldn’t look out of place on a well-maintained four year old vehicle. As we waited for the spanner-wielder from Alfa Romeo to sort out a minor difficulty with a flooded engine or clogged carbs, we had plenty of time to look over the body-work of the car. All of bolt heads and nuts around the radiator base had a little rust here and there but it was nothing to detract from the overall impression. There were a few minor cracks halfway up the b-pillars (left side), but nothing you wouldn’t find on a Spanish or French product of a similar age. There was a hint of corrosion in the rust traps under the rear edges of the front wings, where the sills meet the base of the c-post. And the snapper found some tin-worm in the guttering around the boot – though, to be fair, there was next to no bubbling on the top steps. The paint finish (Bright Lemon Curd) was quite glossy and there wasn’t all that much orange-peel effect to be seen. That’s one advantage of thin paint. A few stone chips were visible on the trailing edge of the doors and around the high boot lip. Nothing will fall out of the boot though. I dare say you could probably keep a few Italian kidnapping victims in there, such is the capacity. The boot floor under the carpet was only damp, despite the light rain we experienced on our first evening in the hills of Great Malvern. The 1.8 litre motor finally started readily. It gives the typical Alfa-rasp whenever your boot pushes on the pedal. Said pedal conforms to the characterful Alfa fashion of being very offset, leaving plenty of space for the other foot to rest on longer journeys. There is a little difficulty in engaging first gear but you soon get used to slotting it in on the fourth or fifth attempt. Second gear is easier, taking only two shoves to engage while reverse is simple and only pops out of position if you really accelerate hard. This might be something to note if one wanted to reverse at very high speed down a narrow laneway to avoid another vehicle that could be giving chase. For the Italian market this is an important consideration. Another indication of Alfa’s renewed focus on construction was that there was only minor scuttle shake (and that only on a-roads) and most of the main pieces of trim stayed in position over the course of our 210 mile tour. From a performance standpoint the Alfetta is a success. Nought to sixty takes 10.7 seconds and top speed is 110 mph. This is not your brother-in-law’s Vauxhall. The car rolled on corners but less than was normal from earlier Alfas from the 1950s. The Alfetta can either be made to oversteer or understeer on demand, depending on how your foot plays the throttle. In that respect, the engineering objective of a tractable, adjustable sports saloon has been met. When it works it really is a chuckable little contraption. We stopped for a few beers in Coventry, after covering ninety miles from London in under two and half hours. We felt there was much to admire in the car. There were no large leaks from the engine or transmission. But, the fuel tank is a very disappointing 10.8 gallons. This could, in my view, count against the car. Even Ford and the idiots at Vauxhall can offer a bigger tank on their decidedly more workmanlike Cortinas and Vivas. The Alfetta is a worthwhile entrant into a hard-fought market sector with the Germans catching up fast in some (but not all) respects. If you do feel the Alfetta is the car for you, take your time at the dealer to check a few things. Look for water trapped behind the screen rubbers, especially if the drain holes have become blocked. If the gear-change is a little stubborn, check the dealer has used the right oil and that the bushes have been adjusted properly. Replace the timing belt and sparks. There may be leaking around the differential while the rear bearings can suffer extensive wear. A further problem might be the disintegration of the gearbox mountings and there may be driveline harshness as a result of the rubber doughnut couplings in the propshaft starting to fail. Rust can be found in all the usual places so make sure the car has been dry-stored prior to sale. That said, if you are properly prepared, you can indeed invest in the new Alfetta and not have to make many excuses. A three speed ZF automatic is promised for the autumn. The Alfetta should have been magnificent with such a superior mechanical layout and that wonderful twin cam unit up front, yet Alfa somehow contrived to make a hash of it. The ropey build quality and lamentable rust protection was one thing, but the gearchange and handling appear to have been somewhat variable as Car magazine pointed out in their 1979 GBU review.